50% Duck Down 50% Duck Feather Cassette Quilt | Superior Quilt Co.
Packaging: PVC wire bag with colour insert. Also available in nylon bag. Our quilts are filled with a mixture of quality Duck or Goose feather and down. The quilts are a cassette style or box walled construction which is a non adjustable design. Featuring a series of individually filled squares, which maintain an even distribution of warmth. We offer a range of quilts which suit different needs and sleeping habits. Walled and channelled quilts are also available. Down is the soft and fluffy clusters which grow under the outer layer of Geese and Ducks to protect them from the cold. Down is a lighter and has better insulation capabilities than normal feather. The more down content the better the quilt will be for warmth and quality. 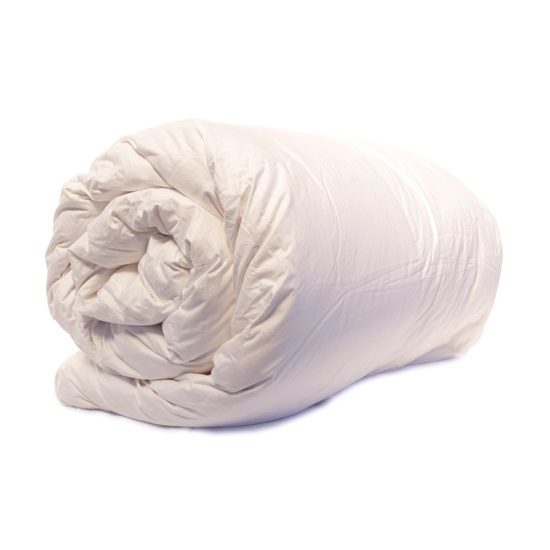 The Superior Quilt Company is a leading supplier of feather and down quilt products. We offer a full range of cassette quilts that feature down and feather blends. The comfort of down and feather quilts is designed with features that will help you fall and wake up to a new morning. The reasons for the increasing popularity of the down quilts, there are multiple elements of downs and feathers that contribute to the beneficial aspects of bedding accessories. Down comes from under the outer layers of geese and ducks. It is designed to help protect these animals from the cold in their natural environments. Down also offers better insulation capabilities when compared with feathers. Despite its lightweight properties, a quilt with a high down content will be warmer. The blend of feathers and down give our quilts the ability to breathe and will provide insulation from moisture. With these many benefits, owning a feather and down quilt becomes a must to add comfort and luxury to effective sleeping. Combining the quilts with a duck feather mattress topper, from our range will give you a lavish sleeping experience. We also offer several size options including single, queen, double, queen, king and Super king (only in 80% Duck Down or 80% Goose Down) so that you can find the right size for your needs. Our quilts feature a cassette style or box walled construction for superior durability and performance. The individually stitched and filled squares ensure the even distribution of warmth. With quality craftsmanship and fillings, our quilts are designed to last for a lifetime. Our friendly staff is available to help you to select the right wool under blanket or duck down quilt for your needs. Call us on (03) 9462 5888 to get assistance or to place an order.